One of the greatest treasures and unique features of the Saka Manor interiors is the antique furniture imported from England. The selection was made based on classical and traditional tastes. The conservative English keep copying the styles they have grown to love to this day. 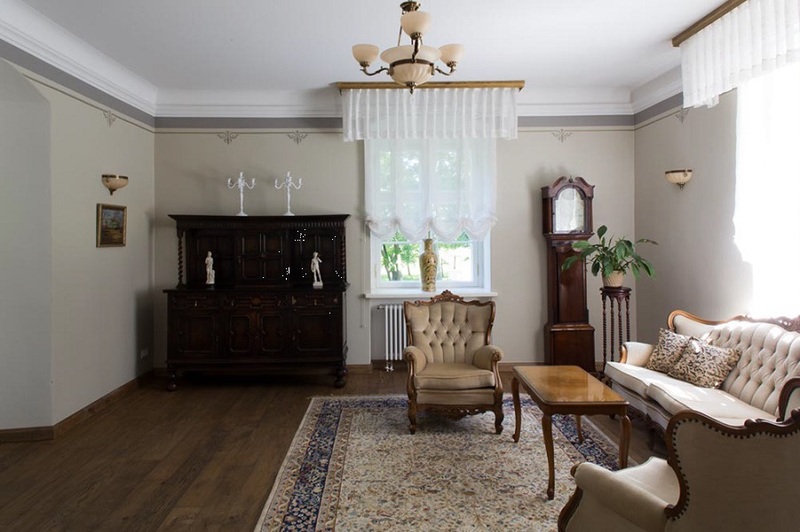 Saka Manor is nevertheless furnished primarily with antiques from 1880 to 1920. Chairs range from the Chippendale, elaborated with lion paws, to the Queen Anne style. In the dining room, classical, straight-lined mahogany Sheraton and Hepplewhite chairs surround oval tables. The oldest feature in the mansion is probably a tall clock. The guest rooms are fitted with Victorian wardrobes and chairs, and antique oval mirrors on the walls. A sight in of itself is the Head of State Suite, furnished with two spacious beds and a magnificent wardrobe from France, decorated with elaborate intarsia inlays that use over 10 exotic types of wood, including green rosewood, walnut tree and mahogany. The wonderful antique furniture collection of the manor is not part of a museum exhibition; it is an intrinsic part of the Saka experience. The British love to place small tables alongside walls and between chairs. Guests will find dozens of such tables, mainly of valuable mahogany wood. Gentlemen can enjoy fine whisky and cigars on the Chesterfield armchairs and sofas, decorated with large buttons and genuine leather covering.